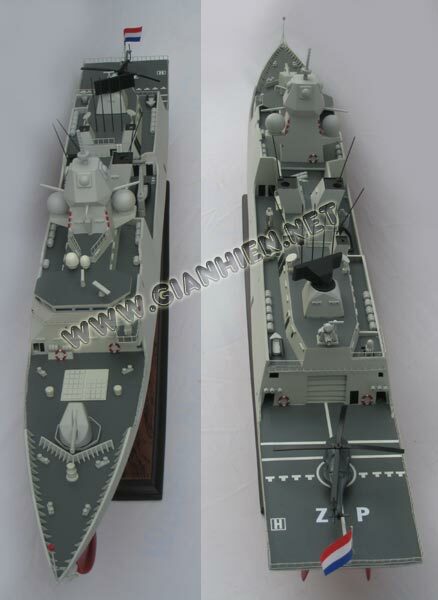 This ship model is hand-crafted from wood with planks on frame construction and painted as the real ship. There are no plastic and this model is ready for display. 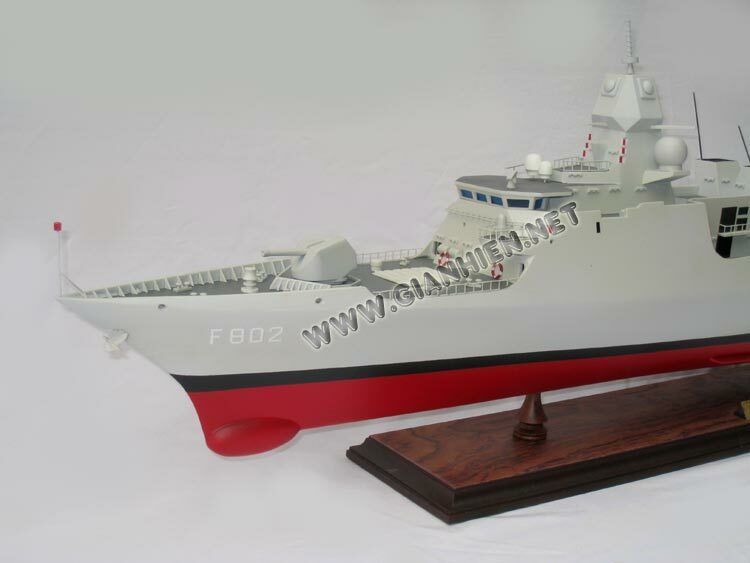 Royal Schelde of Vlissingen is built four air-defence guided-missile destroyers of the De Zeven Provincien class for the Dutch navy, the first two with a command (flagship) capability as successors to the two Tromp class frigates and the second two without this capability as successors to the two Jacob van Heemskerck class frigates. Ordered in February 1995, De Zeven Provincien was commissioned in April 2002, the Tromp in March 2003, the De Ruyter in 2004 and the Evertsen in 2005. The ships are the result of a tripartite programme initiated by Germany, the Netherlands and Spain. 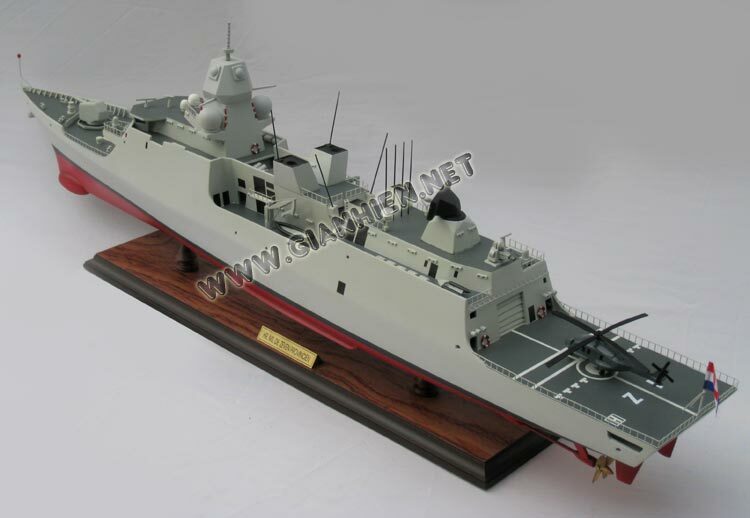 Thus Germany and Spain are building three Sachsen and four Alvaro de Bazan class frigates with much ship platform commonality with the De Zeven Provincien class ships. 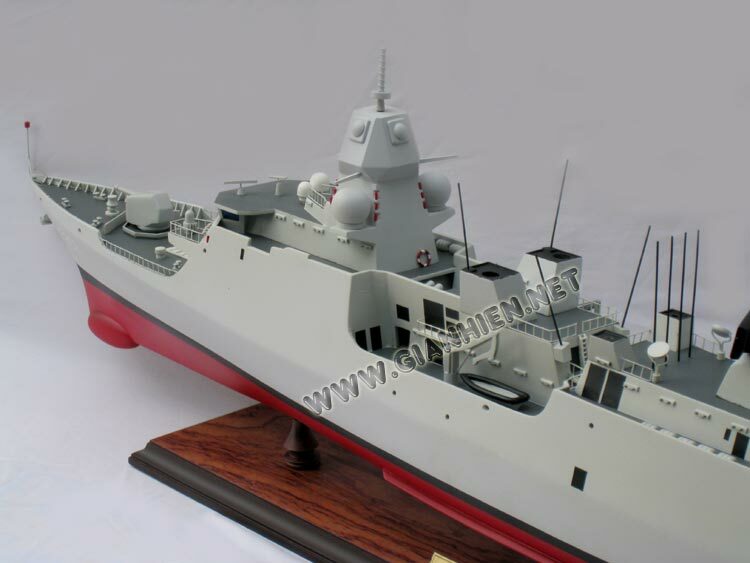 The design of the ship incorporates stealth features to minimize the radar, thermal, acoustic, electrical and magnetic signatures. Meanwhile compartmentalization, insulation, redundancy in vital systems, power distribution, and structural features to channel and retain blast and fragments combine for enhanced survivability. For NBC protection the ship is subdivided into two main citadels and one sub-citadel. 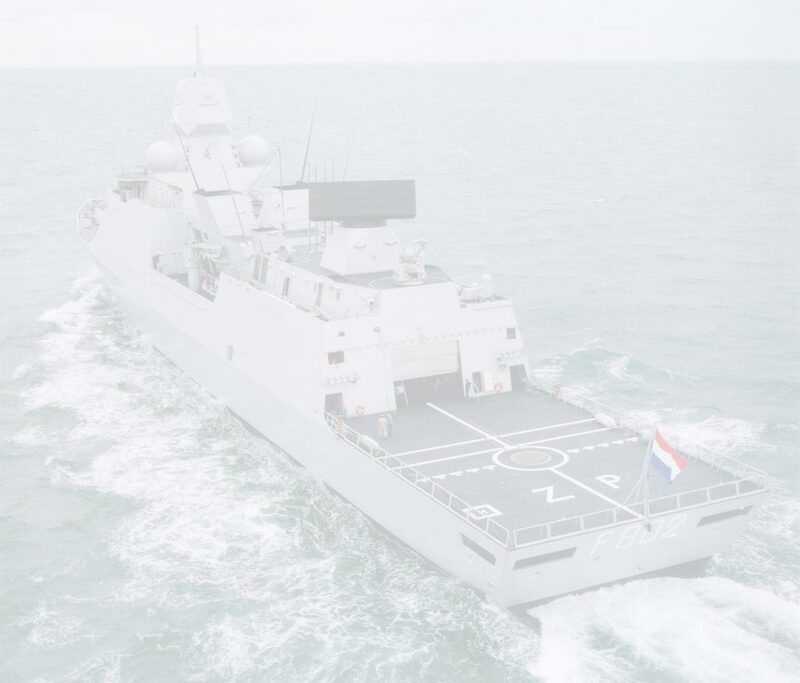 The core of the ship's operational capability is the SEWACO XI combat data system developed by Thales Naval Nederland (originally Signaal). The shorter-range SAM system is the Evolved Sea Sparrow Missile (ESSM) developed by an international team led by Raytheon Missile Systems with semi-active radar guidance and vectoring of the rocket motor's thrust for greater range, speed and manoeuvrability. The medium-range SAM system is based on the Raytheon Standard Missile SM-2MR Block IIIA with a range of 70 km, speed of Mach 2.5 and semi-active radar guidance. Both the ESSM and SM-2MR are launched from a 40-cell Mk 41 Vertical Launch System (VLS). The five octuple launchers are installed with the caps almost flush with the surface of the forecastle abaft the main gun. 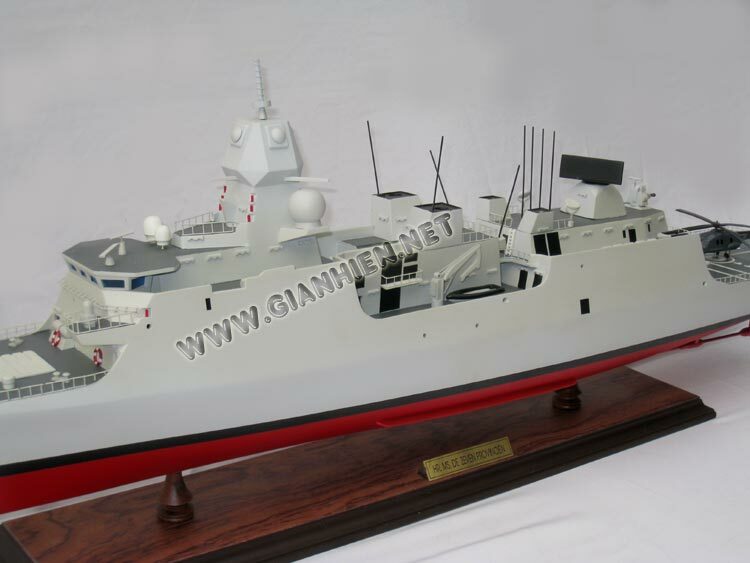 Expanded anti-ship capability is provided by the Harpoon missile system located on the raised deck immediately abaft the mast. 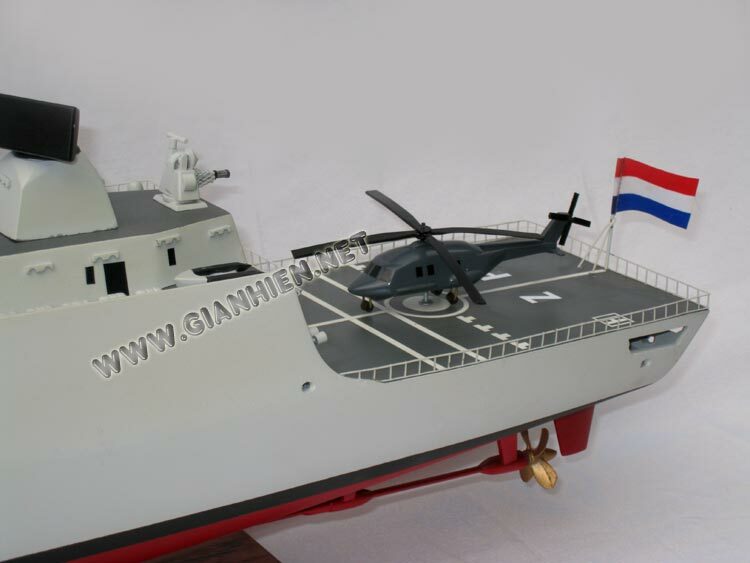 The ship's main gun is a 127-mm Otobreda L/54 weapon, and last-ditch defence against anti-ship missiles ir provided by two 30-mm Thales Naval Nederland Goalkeeper CIWS, one just forward of the mast and the other on the roof of the helicopter hangar. 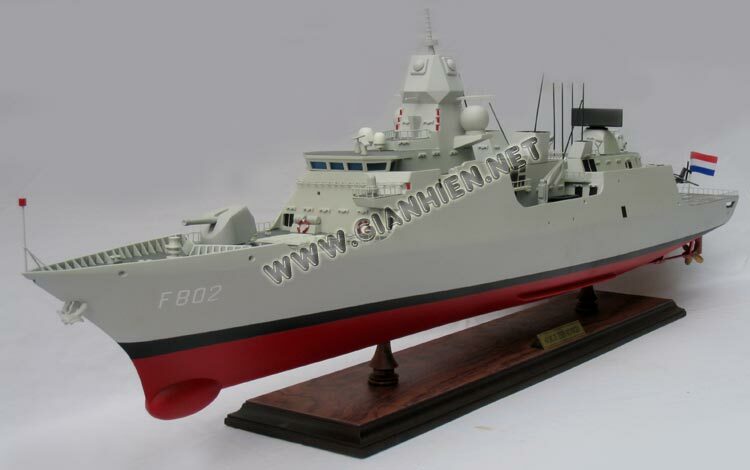 There are also two 20-mm Oerlikon cannon (to port and starboard of the mast). Short-range anti-submarine defence is vested in two 324-mm Mk 32 twin launchers (one on each side of the ship) for 24 Mk 46 Mod 5 torpedoes, Longer-range anti-submarine operations are entrusted to a singleLynx (to be succeeded by the large NFH 90 from 2007) helicopter stowed in a hangar just forward of the flight platform (with a DCN Samahe handling system) located over the stern. 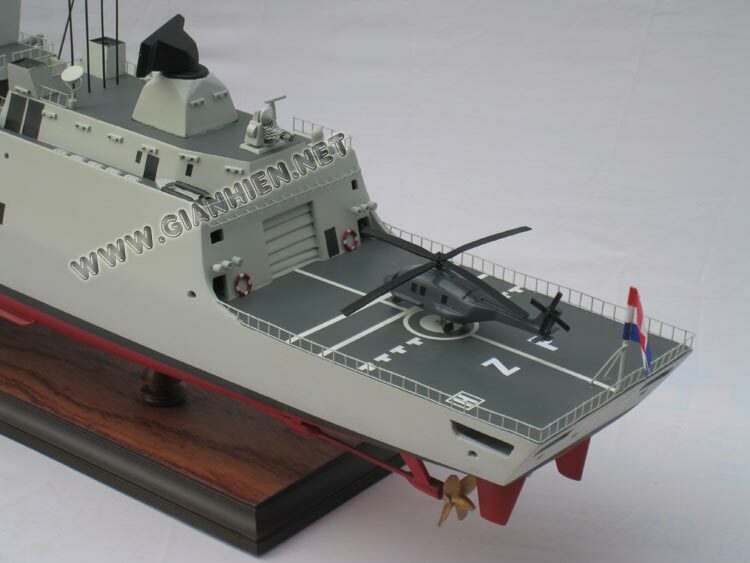 The ship's radar suite is also supplied by Thales Naval Nederland. The SMART-L system above the hangar provides 3D air search, the APAR (Active Phased Array Radar) round the mast provides air/surface search and SM-2MR fire-control capability, and the Scout LPI (Low Probability of Intercept) radar on the front of the mast provides surface search. Other key Thales elements are the Sirius long-range IR search and track system above the bridge and the Mirador optronic surface surveillance system. The sonar system is the STN Atlas Elektronik DSQS-24C bow-mounted active search and attack equipment. As indicated by its character as a CODOG system, the ship's propulsion system has two independent elements. The two Rolls-Royce Spey SM1C gas turbine units each provide 19 495 kW (26 150 shp) for high-speed operations, while the two Stork-Wartsila 16V 26ST diesel engines each provide 5070 kW (6 800 shp) for economical cruising. The two gearboxes are installed in a separate transmission room, and the ship has two propellers of the control lable-pitch type, and two rudders that also provide roll stabilization.